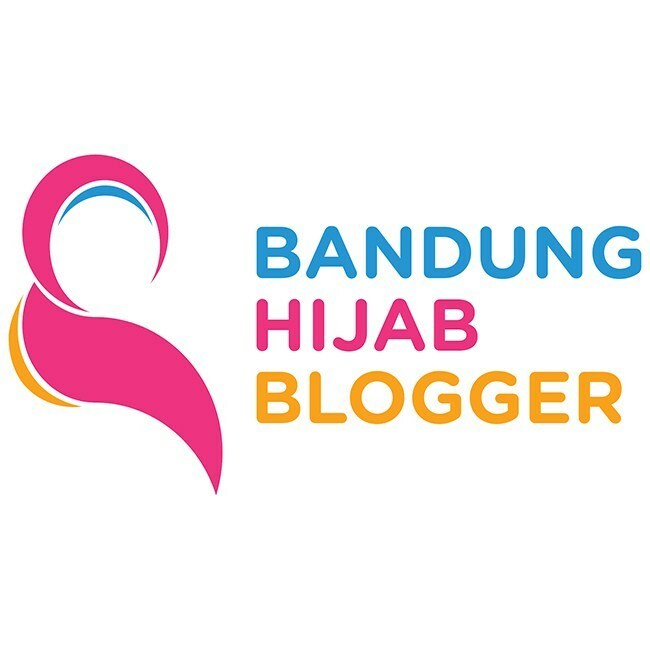 Bandung is the capital city of West Java, Indonesia. Here you can find many interesting local dishes. 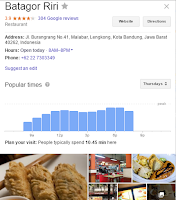 One of famous cuisines is batagor Bandung. This Sundanese special food is already widely known. 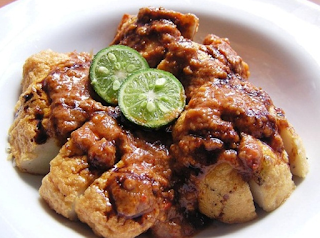 Batagor is an abbreviation of bakso tahu goreng (fried tofu meatball), usually made from flour/tapioca mixed with fish and fried tofu, served with peanut sauce. The meatball dough is usually made of mackerel. Sometimes, tuna or even shrimp can also be used to mix batagor dough. How to eat batagor? You cut it into bite-sized and add peanut sauce, sweet soy sauce, and a little lemon squeeze or you can dip it and just take a bite. Batagor has a crunchy texture and delicious flavor. In an effort to minimize costs, some batagor sellers use fish paste rather than real fish to mimic the flavor. However, for some of the famous batagor outlets in Bandung, they usually use fresh fish and good ingredients. This food has become very famous in Bandung, even has been known as a culinary icon of Bandung. One of the famous batagor outlet is Batagor RiRi which was founded in 1985. The place is designed in a fast-food restaurant style featuring a counter that has menus in the picture. The walls are decorated with pictures signed by Indonesian celebrities. Batagor RiRi presents family recipes using fresh fish and tofu. Batagor Riri and the key to its success lies in fresh ingredients with delicious flavors and its textures. 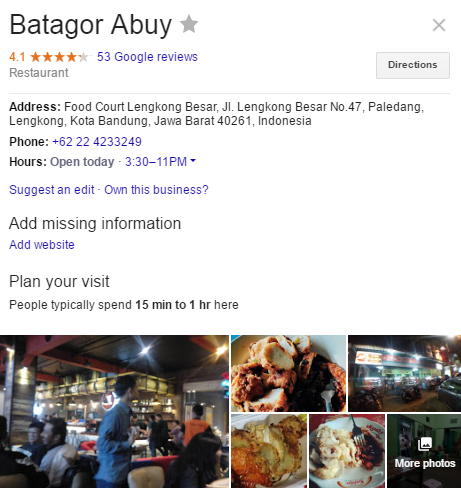 Batagor Abuy is not a restaurant-style batagor outlet, open from 4 pm to 11 pm. 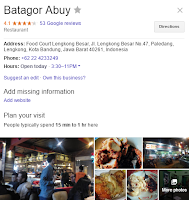 When compared to other famous batagor outlets, Batagor Abuy is not offering fancy place, but it's still a favorite of some people, because it tastes good and the price is affordable. The outlet decoration is simple and modern. The place is clean enough and more importantly that Batagor Kingsley has a very delicious batagor taste. 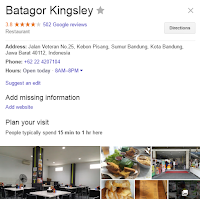 That is why, apart from the simple place, Batagor Kingsley is always crowded with the customers. 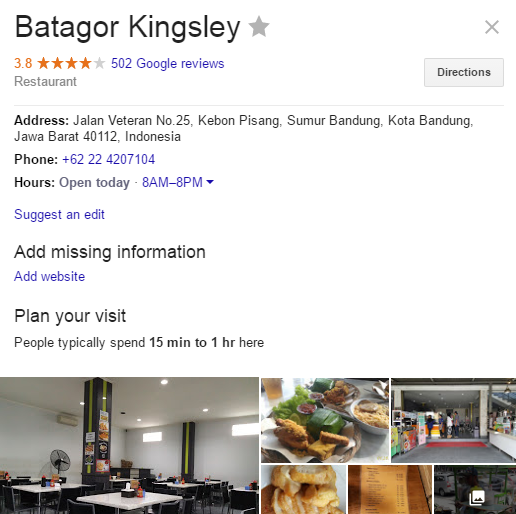 There're also other famous Batagor outlets in Bandung which you can find easily. Currently batagor is becoming one of the typical Bandung cuisine that is usually selected and seen by visitors and tourists. Batagor also has affordable price and easy to carry. Aku pas ngidam anak pertama Mau batagor tapi nggak ada yg rasanya kayak di Bandung hihiii..
Aku belum pernah coba batagor di luar Bandung. Hehehe boleh juga kayaknya kalo ada yg jual di luar pengen tau rasanya. Aaah mauuuu :).. kayaknya enak bangeeeet ya Zia. Ngiler berat euuy!